This hard cover book is separated into 8 sections in its table of contents. Everything in the table of contents is self-explanatory, except for categories of blasters if you’re not familiar with Nerf. The Light Blasters are the small, pistol-esque blasters. Medium blasters are the slightly bigger, higher rate of fire blasters. And the Heavy Blasters are Nerf’s biggest, largest, fastest rate of fire blasters that they have. Before I tell you more about the book, you should know that the title is a bit misleading. The book only covers about the last ten years of Nerf blasters and accessories. You would expect a bit more of information on older Nerf blasters due to the title, but again only the last ten years or so are covered. The oldest history we get is an introduction to the brand and some of its older products at the start, and a timeline of its past to current products at the back of the book. The blaster lines covered in the book are N-Strike, N-Strike Elite, N-Strike Elite Mega Dart Tag, and Vortex. It’s a little strange that the popular Rebelle line nor the Zombie Strike are covered at all in the book. The Rebelle line isn’t mentioned at all, but the Zombie Strike line is teased with the logo on the last page of the book. 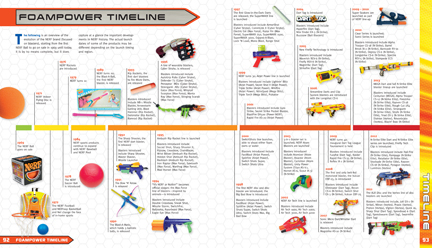 Super Soakers also aren’t covered, but are shown in the timeline. One of the things that really jumped out to me as soon as I opened the book was the large amounts of high quality photos that are in the book. It’s hard to tell from the above sample image they gave me to show you all, but the photos of the blasters used obviously taken from high quality sourced images, with great lighting and presented nicely. For me, it was a pleasure just looking through the book even though I knew most of the blasters already. The high quality, large resolution photos helped give new life to older blasters I haven’t seen in a while or ones I hadn’t used too much before. Each blaster is covered in a similar fashion. Photos of the blaster & it’s other paintjobs/decos are presented, along with a table of information including its Type, Propulsion System, Capacity, Rate of Fire, Ammo Type, Range, Number of Tactical Rails, Length, and it’s year released. With the author doing this, I feel like it can show the casual user or player that Nerf is a little bit deeper than just a kid’s toy brand. All the number estimates (such as Rate of Fire or length) are very close to what the blaster can actually do or what it actually is in stock form. The only thing the casual user should be wary of is the range claims. They are measured when the blasters are fired at an angle, in order to achieve maximum range. The vast majority online measures shoulder height, aims parallel to the ground in a straight line, and reports their ranges on that. The blaster descriptions are solidly written. They tell the reader some of its history, it’s features, and how to operate and fire it. I was actually able to learn more about some older blasters due to the information presented. The amount of words efficiently explains some of what the blasters can do. Sometimes the descriptions are written in a bit of an excited tone, and you can see this most often in the descriptions that end with an exclamation point. At first it annoyed me a small bit, but I got over it when I imagined that it goes better for someone learning something new or a reader taking a tour of the Nerf items. Ammo from the covered lines of N-Strike, N-Strike Elite, N-Strike Elite Mega Dart Tag, and Vortex are also mentioned. The facts are presented in a similar table that the blaster information is presented in. The points mentioned for the ammo are Length, Diameter, Tip Material, and Year introduced. Again, not every time of ammo is covered. Only the original Mega Dart, Micro/Suction, Clip System/Streamline, Sonic Micro/Whistler, Elite, and New Mega Darts are covered in the ammo section’s detail. The Vortex XLR Disks are in there as well. The Accessories section is a bit on the bare side. Again only accessories made from about the last ten years are included and covered. 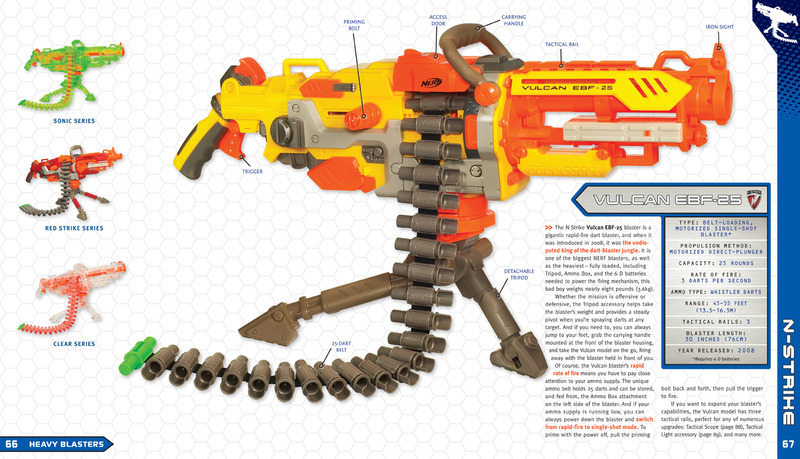 Many of the descriptions are on the shorter side due to the author not choosing to say as much about them as the blasters, and some accessories (such as the Dart Drums, Shoulder Stocks, and Barrel Extensions) are swept into its own separate sections. For example the Raider Stock and Retaliator Stock don’t have their own separate sections, their instead included into “Shoulder Stocks”. It’s understandable that the section is shorter and has smaller descriptions then the blasters. With accessories, theirs also less dimensions (no Rate of Fire, no Ammo Types, etc) to talk about. With the title having the word blaster in it, I’m sure the author also wanted to focus more on those, and less on accessories. A really cool thing that was included in the book was some info on how blasters we’re designed. In this case, it’s exclusive information the Vulcan and the Mega Centurion. We also get told about, and shown, design sketches and what the designers were thinking when they started to design those blasters. That requires inside information and you won’t find that information on the internet. It’s quite interesting to hear some designer thoughts on those popular blasters. The only thing I don’t like is that the book didn’t dive into too much detail with blasters older than 10 years or so. 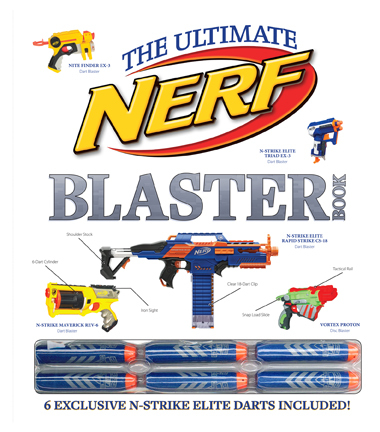 With the title The Ultimate Blaster Book I was expecting it to look back into Nerf’s history a bit. Although the book didn’t do that, and hasn’t included the latest, new products such as Rebelle & Zombie Strike, it’s still a very enjoyable book to read. Its analysis and information presentation has given a nice base for future Nerf books should they decide to take a similar route. With its very reasonable suggested price of $21.75, it would make a good “stocking stuffer” for the holidays, or a small gift for young fans due to the amount of large high quality photos in the book pages. 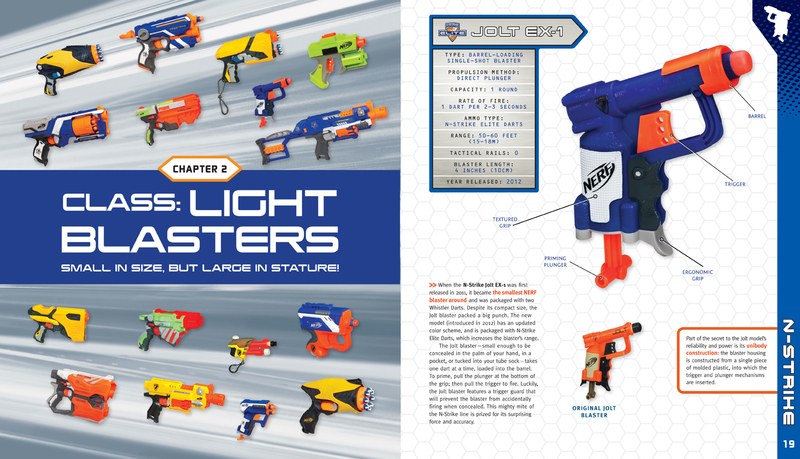 Casual or new players of Nerf could also enjoy learning more about current and past blasters. Long terms fans of Nerf would probably be a bit disappointed due to the lack of information on older blasters. More knowledgeable fans might not find the book interesting due to them knowing much of what’s already found inside. I enjoyed reading through the book and finding out new things about older blasters. I can picture myself picking this up once in a while to browse through the photos and brush up on my information. All in all, I give this book a 7.5/10. You can purchase this book from Amazon.com at a current sale price of $13.17 USD. Nice review. I wouldn’t fault a physical book for lacking information on the newest lines and products, the publisher needed a finalized copy well in advance of it’s actual printing and distribution, and the information on the two latest lines are rather recent in that context. The detail that I was hoping to see in your review is a review of the darts that come with the book. Can you provide any details or pictures?